TAXES are adding a staggering $340,000 to the cost of an average­ new home in Sydney. Former Business Council of Australia president and Commission of Audit chairman Tony Shepherd said that federal, state and local governments­ were squarely responsible when it came to housing affordability — firstly for not unlocking enough supply­ and secondly for imposing­ outrageously­ high taxes and charges. “The cost of government charges on a new home in Sydney is now over $340,000,” Mr Shepherd said. Mr Shepherd, who is conducting a review for the Menzies Research Centre on why Australians are struggling to get ahead, said development applications for new home approvals, rezoning and release of land were simply too long. “In Canberra you can get planning approval for a new home in a residential area in 26 days and that should be the benchmark,” he said. Housing Industry Association NSW executive director David Bare said on the average $800,000 house and land package sold in Sydney today, taxes would be a whopping $340,000. “Until the government addresses these taxes and red tape costs, there’s not going to be any improvements of affordability,” Mr Bare said. Developer Peter Icklow said his company had paid $120 million in GST on new-build homes they had sold over the past 10 years. “If you want a smoker to stop smoking you tax them, if you want developers to stop building you keep up these ridiculous taxes,” the Monarch Investments managing director said. 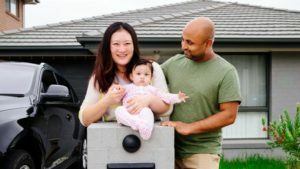 Adnan Khan and Becky Xiao, who recently moved into a new-build home at Ingleburn Gardens Estate, 44km southwest of the CBD, with their two children, said: “In Sydney there’s nothing affordable, which is why we moved to Ingleburn. Mr Shepherd said housing supply was the issue and an idea now being considered to allow first-home buyers to access their superannuation for a deposit would “only put more cash into a market where supply is short and prices will rise”.